The first Disney film to make use of Marvel Comics characters since the house of mouse acquired the company in 2009, Big Hero 6 is another entry in Disney's recent second Renaissance period, with reached dramatic heights last year with Frozen, now the world's highest grossing animated feature. In this latest offering from the renowned studio, we focus on robotics whizz kid Hiro Harmada (Ryan Potter), who lives within the fictional city of San Fransokyo. Hiro is talked into joining Fransoyko's Institute of Technology by his older brother Tadashi (Daniel Henney), and there he meets the rest of his classmates: Honey Lemon (Génesis Rodríguez), Fred (TJ Miller), Wasabi (Damon Wayans, Jr.), and GoGo Tomago (Jamie Chung), who all excel in their own fields of science. 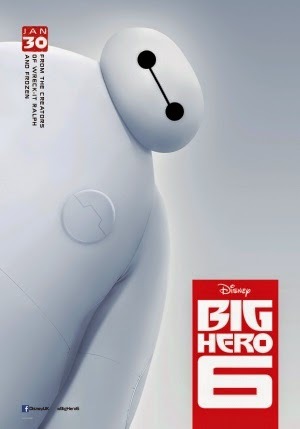 He is also introduced to Baymax (Scott Adsit), a loveable healthcare robot of Tadashi's own making, who eventually becomes Hiro's sidekick as a strange masked villain begins to emerge in San Fransokyo's darkest corners. With Baymax at his side, Hiro must unite with the rest of his new friends to take on this threat as the eponymous superhero team. Big Hero 6 gets many things right, and several things wrong. But it's mistakes are crucial to the film's overall narrative, and so it can be slightly bogged down by iffy pacing. In terms of honest emotion, when the film carries out sad scenes, they're exceptional, but sadly they're not always executed at the right time. The villain has a fantastic design and an intimidating presence, but still lacks true development, and appears in a somewhat predictable plot twist. This equal lack of attention applies to the rest of the superhero team, who's debut appearances are too precipitous, and their subsequent relationship with Hiro a little too shallow. Thankfully, this is redeemed by their extremely likeable personalities and interesting lineup of powers and abilities. But with my negative grudges dealt with, Big Hero 6 excels in many other fields; the animation is beautiful, the characters always charming, the voice acting spot on, and the score by Henry Jackman fast paced and unforgettable. Clearly the star of the show to most audiences, Baymax is of course one of the film's finest characters in terms of comedy and drama, and Adsit's performance is what truly brings this to fruition. There's also no doubt that the film's action sequences are consistently gripping, even if they initially overdo the clumsiness and inferiority of the novice superheroes as the fighting begins. So it will be a mixed bag to some, but while it's certainly not a masterpiece, Big Hero 6 is an exciting burst of entertainment that still upholds Disney's recent string of quality films.